I found this plant growing in my garden underneath some fronds of sedum "angelina". I noticed it because of the bright red flowers but have no idea what it is. 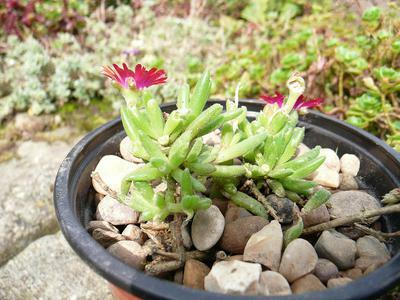 The flowers are about 2cm in diameter and remind me of mesembryanthemum but the leaves are very blunt, round and fleshy. This is Carpobrotus, which is native to South Africa, where it has many names such as Sour Fig, Sally-My-Handsome, or Fig Face. It's intriguing to wonder how on earth it got into your garden; a seed dropped from a hanging basket in the nursery where you got the Sedum Angelina, maybe? This is not a hardy plant (except for it's ability to withstand a lot of drought) so you'll have to decide what to do with it for the winter, to try and keep it alive. They will grow indoors, but they need a lot of light and warm temperatures. 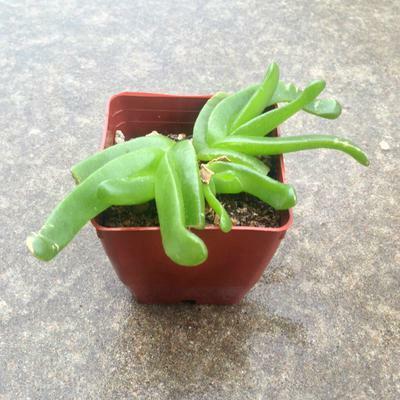 See more about grow lights and this page with more information about the same plant; Three Sided Succulent Spear with Fluffy Pink Flower. Hi Heather, without some idea of the scale of the plant, it's hard to pin down what it could be. You also don't tell me anything about where this plant is growing - outside, in Winnipeg? Indoors as a house plant? Somewhere warm and tropical? It really does help me to narrow down the options when you can tell me more about the background of the plant. So, a couple of options that occur to me, based on the description of the three sided foliage; Some of the South African plants like many Carpobrotus species have three cornered leaves, almost like they have a keel on the bottom, so this could be one possibility. You can see more about Carpobrotus chilensis, Carpobrotus rossii and Carpobrotus acinaciformis on Dave's Garden Website. Hope that gives you somewhere to start, if this isn't the exact one that is in your picture. Just to note: the almost identical photo appears here, so I would say that this plant is Giant Pigface, Sally-My-Handsome, otherwise known as Sour Fig. I bought this cutie about 2 weeks ago, but it seems really sad. I would like to know more about its species and how to care for it, because I just hate seeing its limbs break off. Thanks! This poor little guy is desperate for more light. 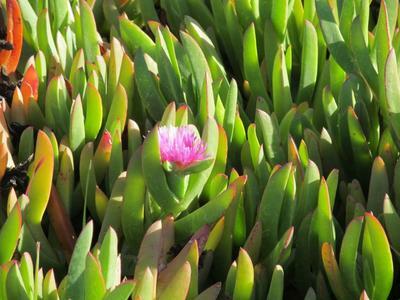 The natural habitat of Carpobrotus is on dry windswept beaches with a lot of light and heat. Without this kind of environment what your little plant is doing is the result. More light and less water will help with the leaves falling off too. You can see more about Carpobrotus here. Doesn't seem to be doing very well.. 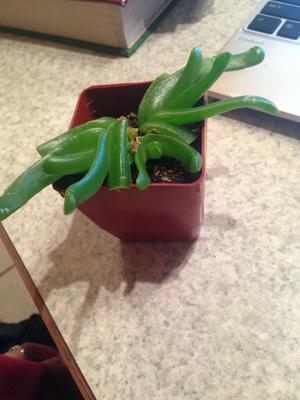 This is a kind of "gummy worm" type plant but it doesn't seem to be doing well at all. It's parts are breaking off all the time and I would like to know how I can prevent that from happening and what species it may be.. Thanks for your help! Comments for Doesn't seem to be doing very well.. I answered your question here.